Drive south on the Alaska Highway from Whitehorse until you see a sign for the Mount Sima Ski Hill on your right. Turn here and follow the road to the Mount Sima chalet. Continue on the road past the chalet for about 1 km. You ca park here where you see another heading up to the right. Although you might be able to drive this road if you have proper clearance and 4-wheel drive, it is in pretty bad shape and may not be worth the effort. The road is about 4.5 km, and takes just over an hour to hike at a fast pace. The route described here includes hiking the road. Start by hiking on the road to the right that leads up towards Golden Horn. You will know when you are at the top of the road when you are above tree-line and find an information kiosk regarding caribou in the area. Continue straight up, along an ATV trail. You will be following this ATV trail most of the way up Golden Horn. It might be hard to see the ATV trail at the very beginning, but make sure you find it before continuing too far, otherwise you'll have to bushwhack. 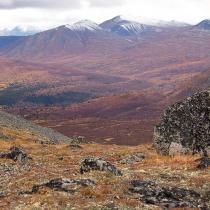 The ATV trail heads south, parallel to Golden Horn, towards the southern end of the ridge. 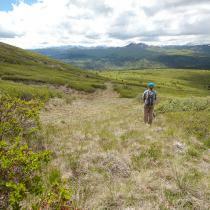 It may seem like you're actually getting further away from the mountain, but continue following the trail as it is much easier than bushwhacking. There are a few muddy, boggy areas on the trail, but they are fairly short. After following the ATV trail south for about 2.5 km, it will turn abruptly left (east) towards Golden Horn. Shortly after, you'll start getting to the flanks of Golden Horn and start to climb up. 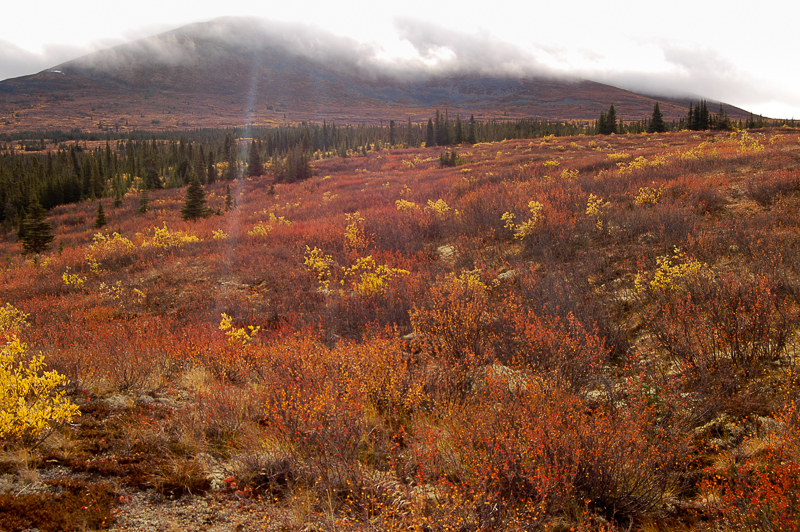 At this point, the ATV trail starts to become bushier, but it is still fairly easy walking. 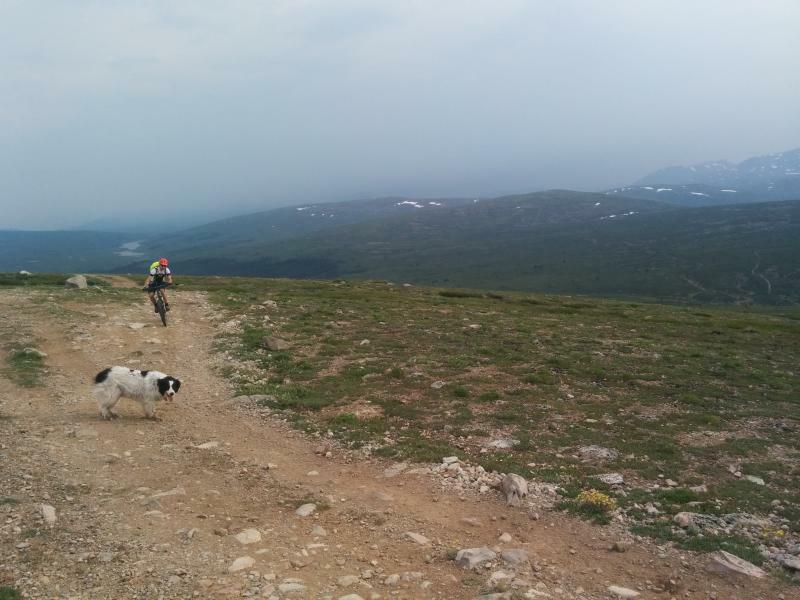 When the ATV trail ends, you should be higher in the alpine and should see some grassy areas that lead to the summit and avoid almost all of the small bushes. Follow these grassy areas up until you are in the alpine, and then head straight for the summit (slightly to your left). You are rewarded with a 360 degree view from the summit. You can see Cowley Lake and Mount Lorne to the east and even Montana Mountain to the south. Follow the same path back down. From the top, it may be hard to recognize the way you took up, so look for landmarks on the way up so that you don't miss the ATV trail on the way back down. Have you been to Golden Horn lately? 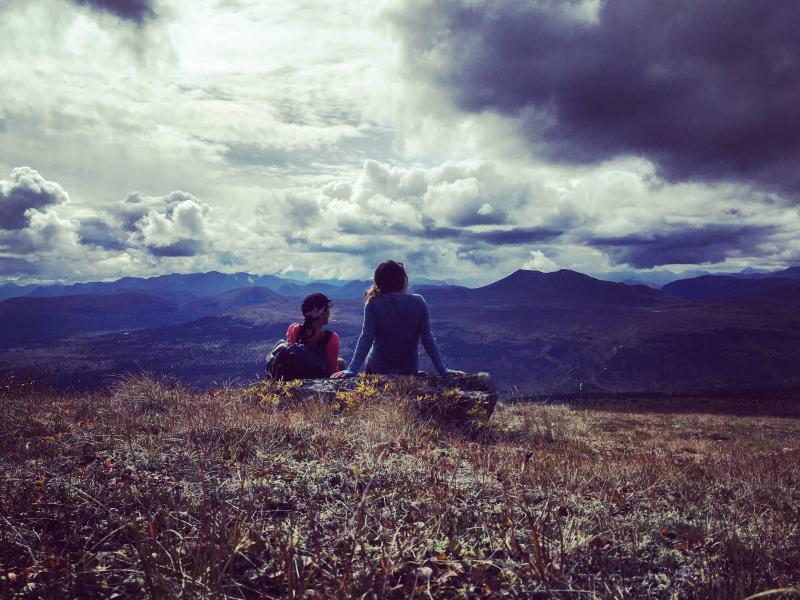 We biked up to the top from the copper haul road. Had to push our bikes near the top but it was a fun descent. About 4 hours total including stops. Went up May 26 and got stopped by massive puddles and km of soggy terain just passed the atv trail. Beautful hike, but its worth waiting 2-3 weeks for the trails to dry up. Tried this hike yesterday, but had to give up. The snowmobile trails petered out after a kilometre or so. Even on snowshoes we were breaking through the crust into 3 foot deep snow. 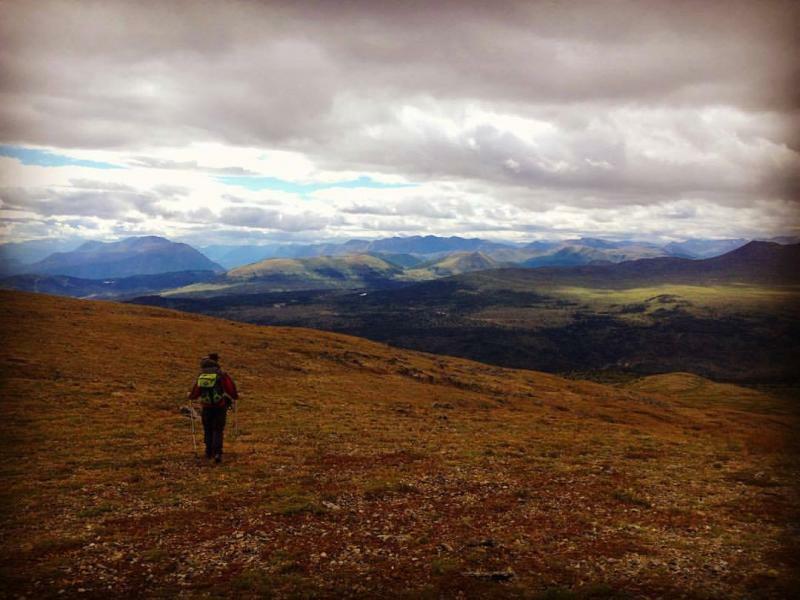 A friend and I hiked to the summit of Golden Horn Mountain yesterday (September 9). 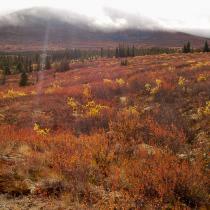 It was a rainy day yet, with the fall colours, it was a very fulfilling hike. The boggy areas weren't too bad, but the low spots had filled up with water by the time we came down--nothing treacherous though. 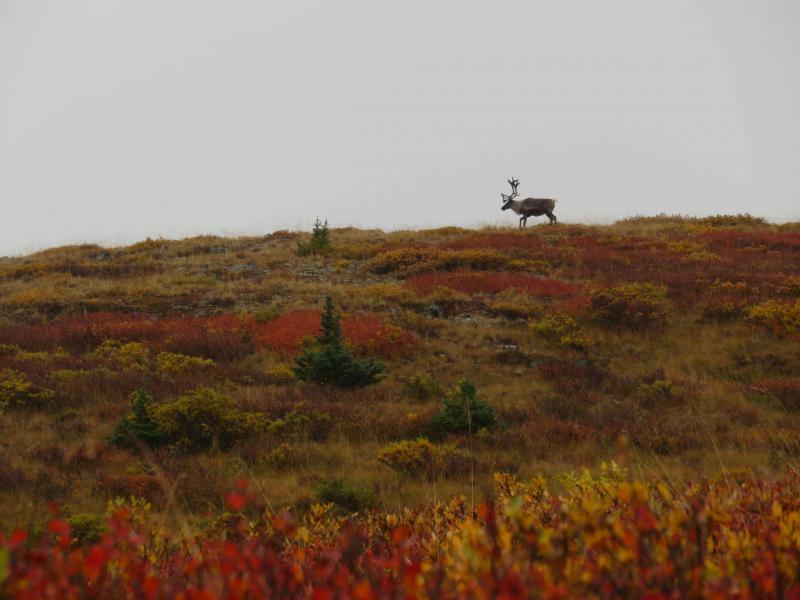 Although we did not experience the amazing 360 degree views from the top, because we were in a mountaintop cloud when we summited, we did see six caribou near the top. Hiked this trail on 13th august. 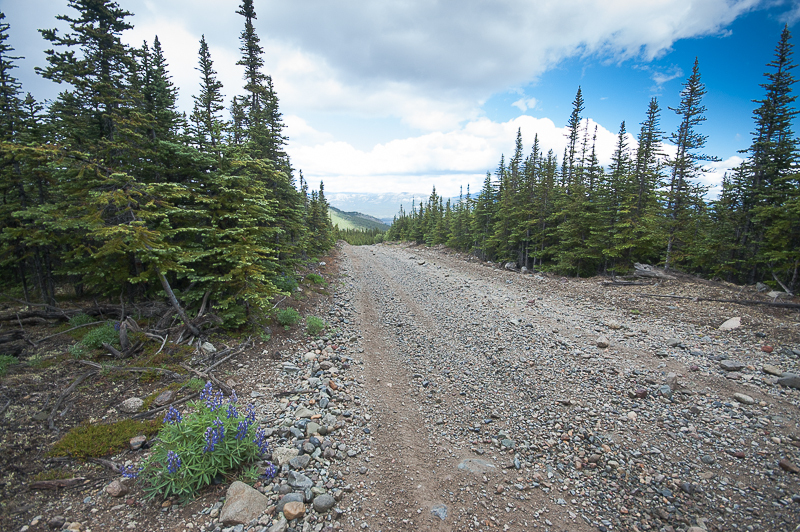 Lucky enough that my Yukon mate had no fear driving up the "road" to the start of the ATV trail - I most certainly wouldn't! But it saved us a hike that I think would'nt have been worth it from my point of view. 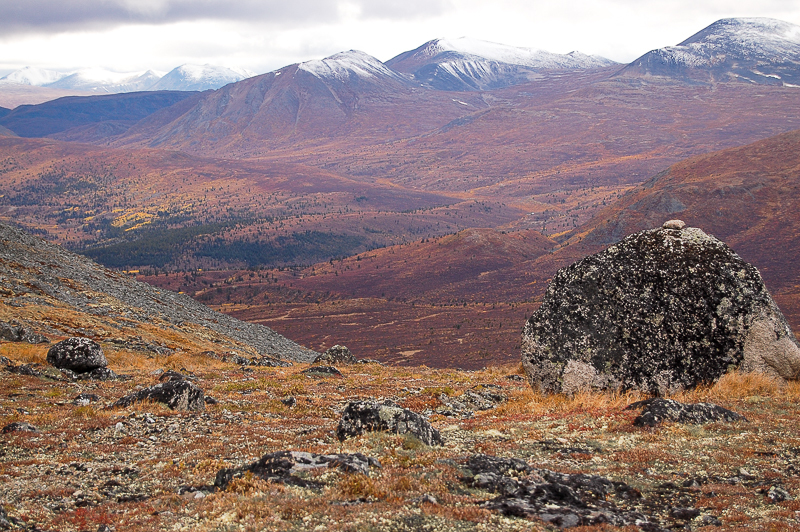 From the ATV trail is is just a long flat hike until the base of the mountain and a short hike to the summit. Its pretty easy hike but I'm sure with the first section it is moderate cause its just time consuming. Beautiful views. Start of the morning temps were -33C. We waited for the temps to warm up a little before hitting the trail head. -24C and we were off, skies were bright blue not a cloud in the sky. Beautiful trek up through the bush. Skidoo tracks had the trail packed down for easy hiking. We were greeted with a happy bunch (10 in total) that hiked to the top of the ATV trail and were all tobogganing down. I would highly recommend this idea, perfect sledding trail!! Our plan was to get to the top of Golden Horn but there was no way this was happening today. WAY too much snow!! We followed skidoo tracks to the right side that took us to the top of peak. We followed the tracks until they ended. Had hot soup and cheers with a beer at the top. We managed to find a little hill to hide behind to block the wind as it was very brisk at the top. We warmed up quickly on the trek back down. Going down went very fast. Temp when we got back to the truck was -15C. 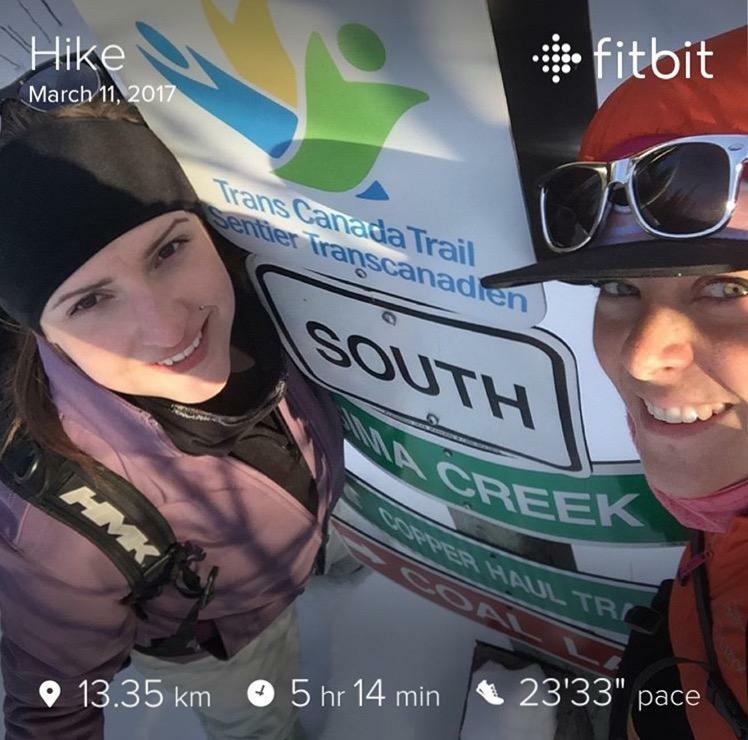 Beauty day for a winter/spring hike! 2. The Caribou Kiosk no longer has any signage in it. But the stands are still there! Can't wait for the snow to melt to attempt this one again!! Did this hike August 28. The kiosk with info about caribou doesn't have any info, just an empty stand but is a good marker. The description isn't kidding when it says it seems like you will be heading in the opposite direction of the mountain, but the trail does swing around eventually. Some boggy areas, but we were able to pick our way around without getting our feet wet. There were a few hunters on their atv's later on in the day. 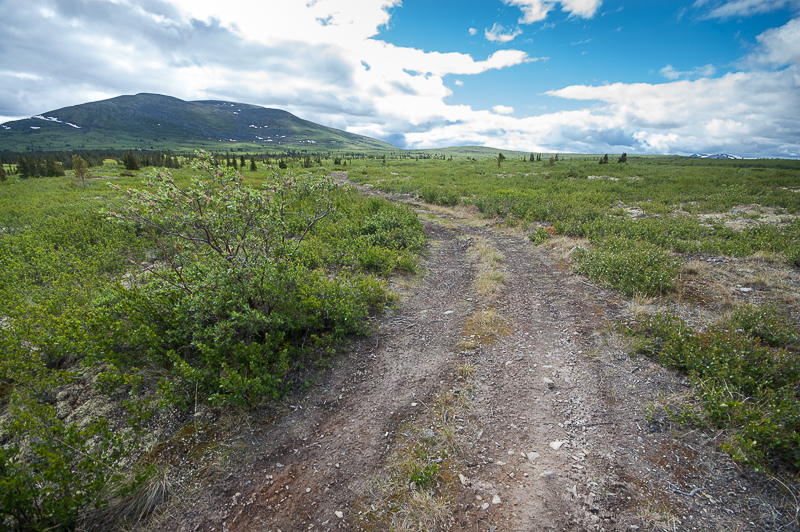 Many atv trails, landmarks are a good idea for finding the way back. Took us 8 hours but we stopped and ate a couple times and hung out on top. Fall colours in full swing. Biked the ATV trail from the "start of ATV trail" point on the map here over to Fish Lake. 6 hours and lots of pushing of bikes later, we arrived. I wouldn't say that i'd recommend the route, but I'm glad to say that I've done it. I'd say a 2 day overnight hiking trip would be better suited to the route. We´ve reached the top eventually, but I´ve got my lesson, ´cause I underestimated the situation and didn´t bring snowshoes with myself so on the huge plateau which you have to get through it, I was struggling due to breaking down in the 1 meter deep snow. It was really physically even mentally exhausting! Due to whole sunny day the snow was extremely fragile. Last steep part was already ok, but still with some snowy/icy parts and there were already some dry parts or just with rocks sticking out from snow so I dig up steps at that icy parts when my hikemates got up nicely because of crampons on snowshoes. The conlusion is that I highly recommend to take snowshoes even in May! Better to have it and don´t need it than oposite way ;). Other than that it´s really nice hike with fabulous views from the top :). Enjoy! Took the dog on a hike to the summit of Golden Horn today (Nov 14). The trail has been fairly well packed by snowmobiles and I was able to wear trail runners almost the entire way. 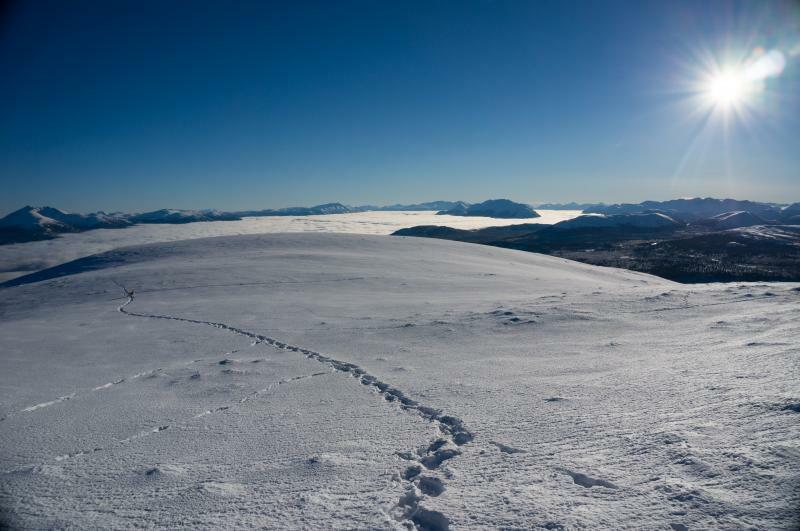 I had to put on snowshoes for the last 500-700 metres to get to the summit. Great hike with 360 views and beautiful weather. Don't let the oncoming winter stop you from getting out. Just remember to take the necessary gear to account for colder weather and shorter days and have fun. 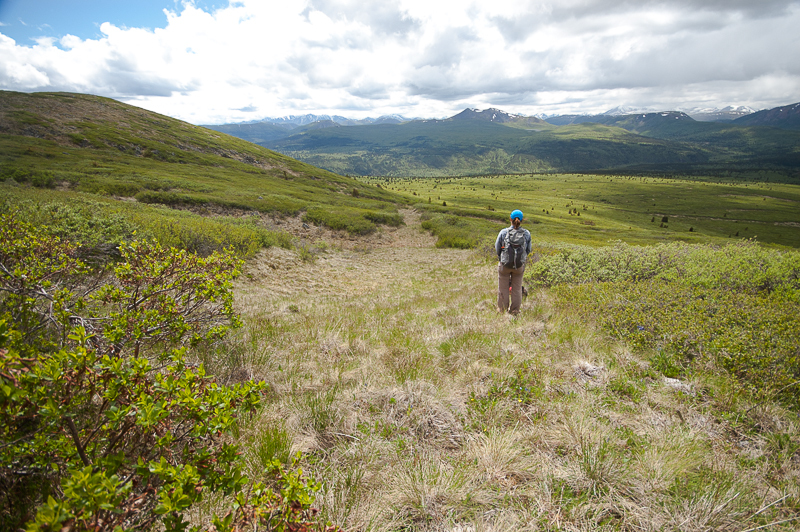 Anthony is right, the ATV trail is a better route because it avoids all of the bushwhacking. We have been meaning to update this route for a few years, and your comments finally prompted us to re-hike this yesterday and update it so that it follows the ATV trail most of the way up. I've done the bushwhack as well (in shorts, of course) but there is an ATV trail that leads straight to the base of the mountain that is a much better route. Look for it on the satellite imagery you can see it easily. Attempted this hike just yesterday on June 26th. 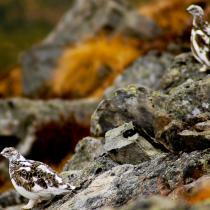 I started in downtown whitehorse, and had some mixed success hitchhiking up to mt. Sima. Along the way, I almost ran into a mama bear and her cub, which prompted me to be extra cautious for the rest of the trip - luckily, I didn't run into any other bears. As the previous comment pointed out, the two kilometers or so of bushwacking from the end of the atv trail is brutal. That 2 km took me over an hour, and getting wet and scratched up was unavoidable. I ended up getting so exhausted from that part of the hike that I didn't make it all the way up the summit! I gave up when my legs got a bit shaky just 100-200 meters from the north peak. On the brighter side, the views were phenomenal, and I thoroughly enjoyed the other parts of the trail. Bugs were there, but nothing compared to Saskatchewan mosquitoes. 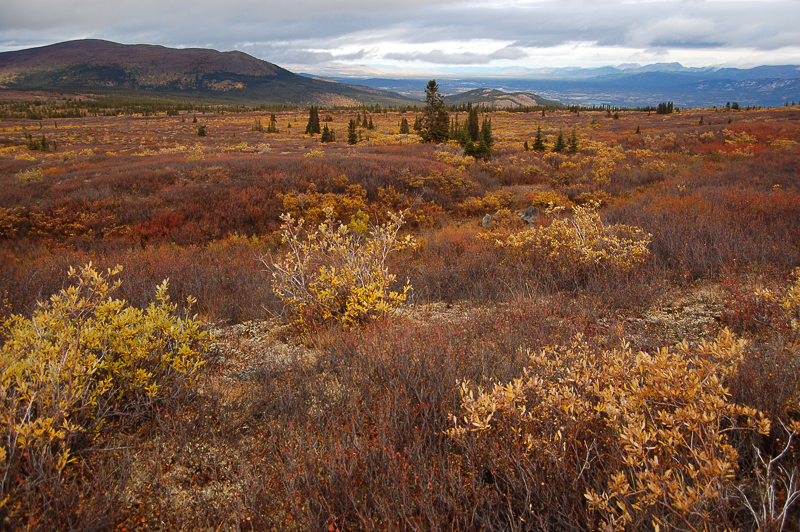 There was plenty of evidence of caribou on the plateau, though I didn't spot any wandering around. All in all, it was a very nice day hike, (took me about 8 hours, hitchhiking included) but I think I'll be sticking to official trails from now on. Three of us went June 15th. 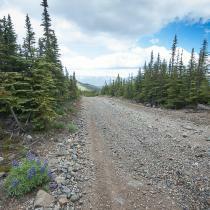 The 4.8 km hike up Coal Lake Road is pretty dull with ATV's roaring by. Once we left the road, the animal tracks petered out within 5 minutes and we bushwhacked for over an hour to get to the foot of the mountain. Forget about trying to aim for the left or right ridge - just get to the mountain using the line of least resistance. 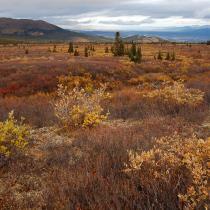 Footing was very bad getting there, with running water and hummocks and tangled willows and rocks. I think all of us fell in water a couple of times with feet tangled in the willows, and got all scratched up. No shorts please. 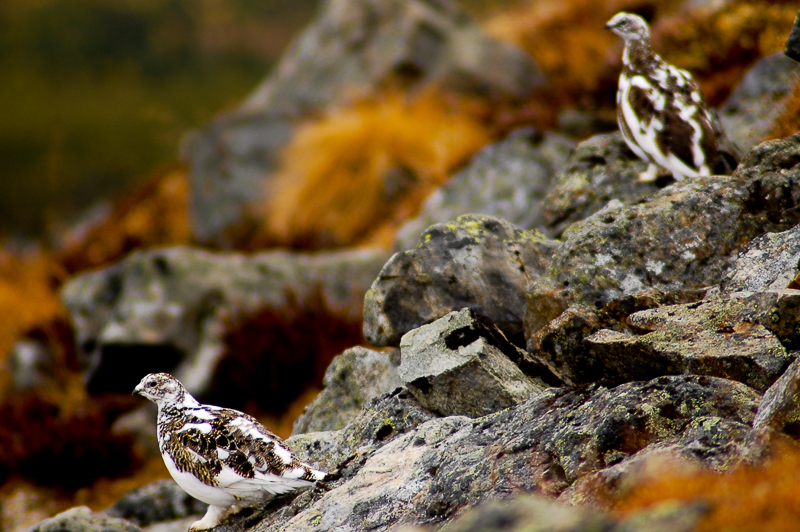 Once at the mountain, it is a slog up the rockfalls with more willow tangling you up. It really only gets easier walking near the top of the mountain, and then the views really are spectacular. Saw a couple of caribou feeding. They seemed to have no trouble getting around! After lunch, then all was repeated, except it got buggy. The headnets were essential. Also heavier boots would be good. Our light trail hikers were not ideal. It was very tiring and hard going and took about 6 hours all told with lunch. Maybe later in the year would be easier with less water to navigate. 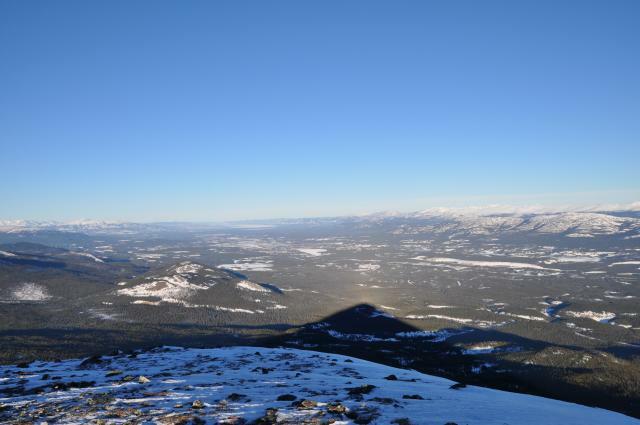 Beautiful January day in the Yukon. Up to the ridge of Golden Horn on Saturday the 25th. Couldnt have asked for better weather. Lucky and caught a couple snowmobile tracks to and from the base made the slog across the plateau not too bad. Splitboarded up the Coal Lake Road today to the alpine area below Golden Horn. It was 9°C! Sunny and warm, and not much snow. The road up was packed and had the usual snowmobile bumps, but the snow was still soft for the ride down. Beautiful hike but there are no marked trails to the summit. Mostly bushwacking but it's fun and you get a great workout. There are some animal trails but they quickly come and go. Head in the direction of the summit and eventually you will make your way through all the bush. When the bush gets higher then your hips there tends to be swampy land underneath. Lots of unseen tiny creeks. You will get wet feet so wear good waterproof hikers. 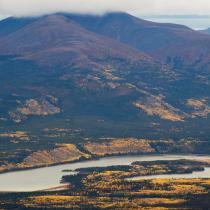 Alastair and I hiked to the ridge that overlooked Coal Lake with a couple of friends on Sept.14th. 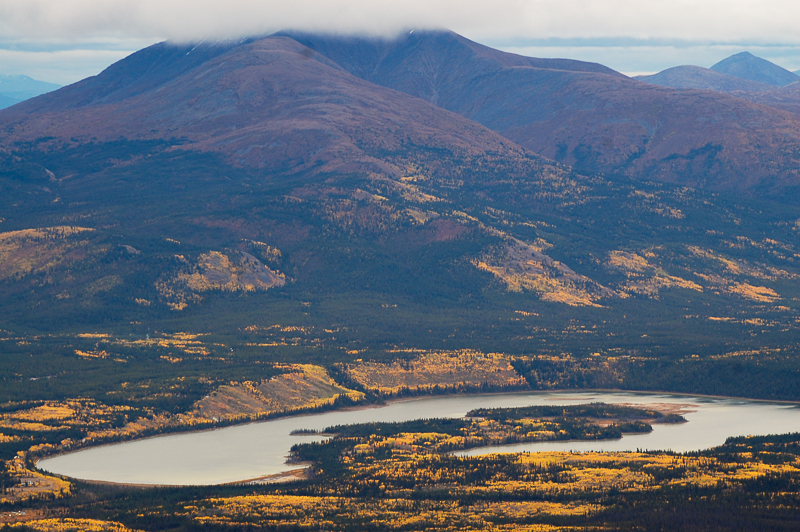 If you want to see incredible panoramic views and soak up the Fall colors, you are in for a treat. Pack a lunch and a thermos of coffee, and be prepared to be in awe of the Creator and Creation ! 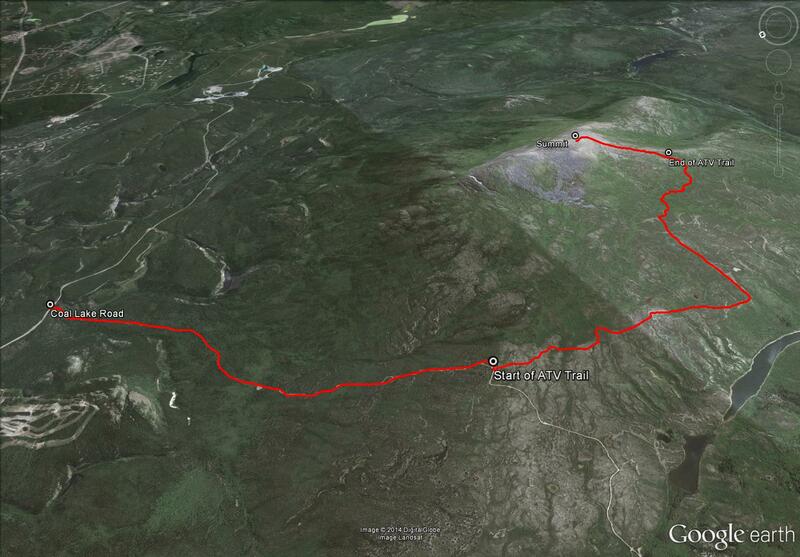 I didn't make it up to Golden Horn itself, but my wife and I hiked the Coal Lake Road that leads to it on Aug 31st. We made it a several hour return hike, and got way above the tree line, into the alpine and spent a few hours continuing to walk the road, which is very well defined, but rocky and uneven in lots of places. Easier on foot than using a vehicle I think. We did in fact meet some people in a rather nice pickup truck on the higher elevations, and he said it was hard on the truck, for sure. Either way, once above the tree line there are great views in all directions...Lake Lebarge to the North, the enticing mountains in the Wheaton Valley area to the South, and Grey Mountain etc behind you to the East as you are going up. Really enjoyed the wonderful time walking up in the alpine areas on a decent 4x4 road with the place almost to ourselves. 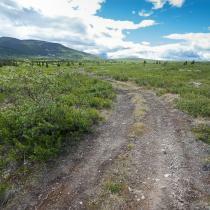 I think perhaps the Coal Lake Road deserves a separate listing, as it is a destination and hike in itself, with people deciding when and where they want to turn around. For us it was a very refreshing and inspiring day out.